Cercis canadensis 'Lavender Twist' is a popular small weeping variety of Judas Tree (also called Eastern Redbud). It's favoured for its spring interest and suitability for small gardens, since it grows to just 2 x 1.5 metres in 20 years. The long weeping branches of 'Lavender Twist' have a gentle attractive twist and in spring they are smothered in a copious crop of lilac-pink, pea-like flowers. The flowers stand out beautifully against the sculptural framework of dark bare branches. This is followed by mid-green, heart shaped foliage which looks particularly attractive covering the pendulous branches. In autumn, the foliage transforms to golden yellow. This small weeping tree will grow in most soils and positions and can even be pot grown given the right care. A lovely feature tree or a superb addition to a garden border, bringing fantastic spring interest. 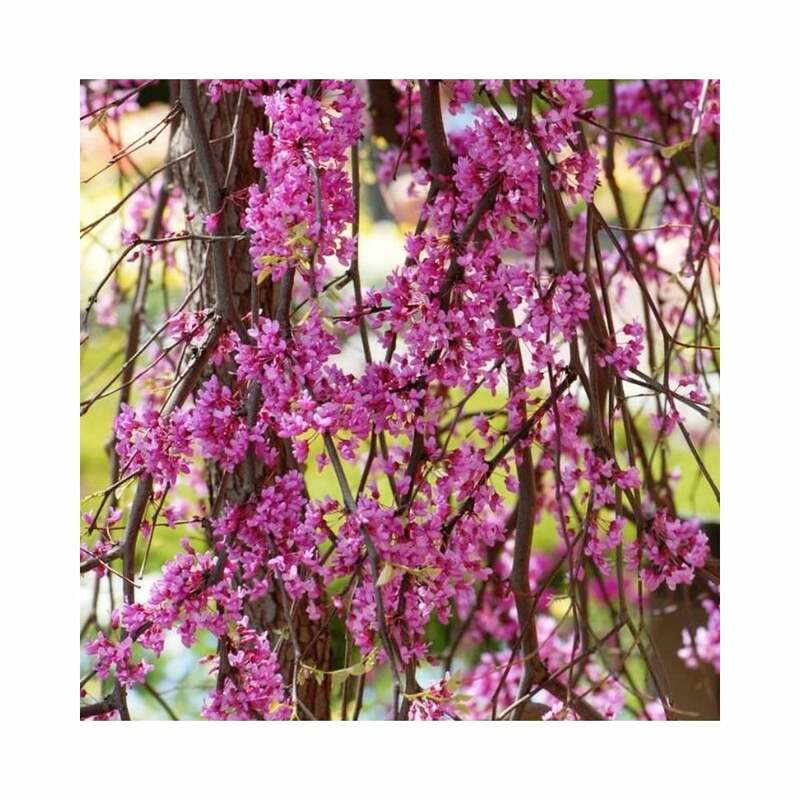 One of our most popular Cercis trees due to its suitability for all sizes of gardens. Also known as Cercis canadensis Covey, named after an American lady called Connie Covey in whose garden this chance seedling first grew. Our pot grown Cercis Lavender Twist trees can be planted at any time of the year. Start by removing weeds and grass within a metre of your desired planting hole, that is ideally in a sunny location. Dig a square hole as deep as your root mass and approximately 2x as wide. To help the tree establish more effectively, sprinkle root grow in the hole. We recommend planting Covey Redbud trees with a stake and tie kit. For single stakes, place the stake at an angle to avoid penetrating the rootmass and knock it in until it is firm. Use a buckle tie, placing the spacer between the stake and tree. If you’re planting Covey Redbud in spring or summer, water well for the first few months. Increase watering if there are extended periods of hot or dry weather. If planting in autumn, you may only need to water a little. Irrigation kits make it easier. Cercis Lavender Twist trees tend to grow with multiple leaders rather than one clear leader. Allow this to occur naturally for the best overall shape. If your Covey Redbud tree requires hard pruning, you can do this in spring/summer after flowering. Any general pruning to remove badly positioned or damaged branches should be carried out in winter.